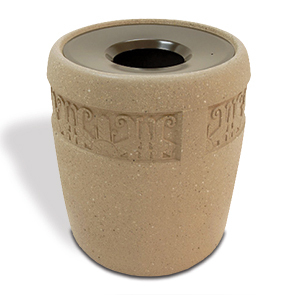 This planter pot inspired concrete receptacle features 9 different decorative 7" cast band design options which creates a custom, signature look. The modern, convex pitch-in aluminum funnel lid securely fits the receptacle and is convenient for everyday use and servicing. Constructed with reinforced concrete, this 43 gallon receptacle is strong enough to withstand the harshest of conditions.